The built-in PoE+ switch allows for PoE connections using a single network cable to transmit video, power, and data between the camera and this NVR. All you have to do is install your camera and run one cable to the back of the NVR, plugging the cable in to one of the eight PoE ports. Then hit remote device search, and your camera will be displayed. This video recorder will start recording that camera. Repeat this simple process of adding IP cameras to your NVR for each camera. This 4K Resolution 8 Camera NVR with PoE is aimed for use with the latest IP cameras we offer, all the way up to 8MP resolution. 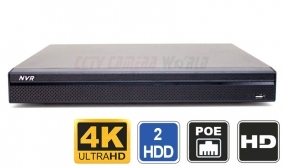 It provides real time video recording using the latest H.264 and H.265 video algorithms. Inside this professional NVR there are 2 SATA ports, meaning you can have up to 2 hard drives; maximum capacity per drive is 6TB. This comes in a slim and sleek design that takes very little room, making it convenient for placement on a shelf. It is powered by a powerful dual-core processor and a embedded Linux operating system that stays virus free. 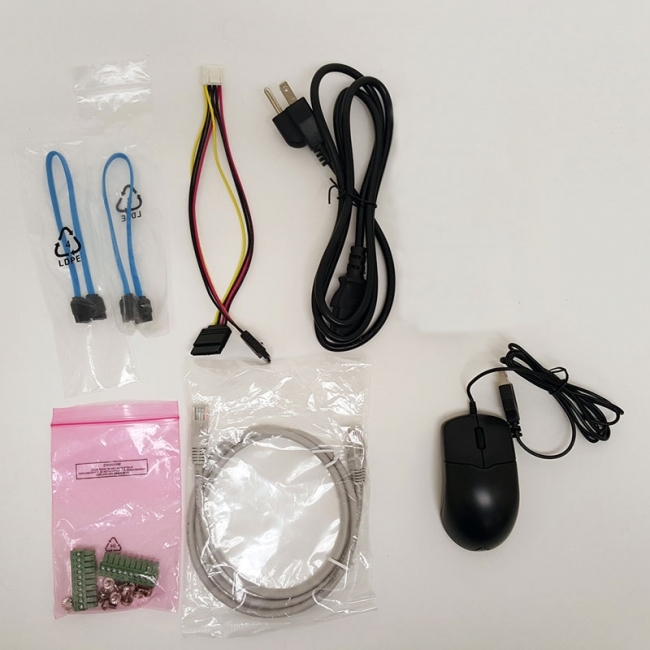 The user interface is easy to use using the included mouse, making it simple to connect your cameras, set recording schedules, and motion detection recording. Video backups are easy to do. They can be done locally at the NVR using a USB drive or external USB DVD burner. You can even download video from the unit over the network or internet using the included FREE VMS software for Windows and Mac computers. This 8 channel PoE NVR comes with FREE Lifetime Technical Support by our expert staff. 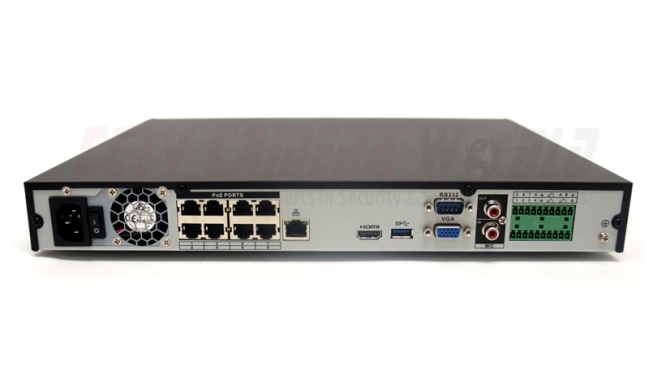 All the IP cameras we sell at CCTV Camera World are compatible with our NVR recorders. If you are looking for compatibility with cameras purchased elsewhere, please be sure to review our IP camera compatibility list. I'm ordering the NVR above, are these cameras compatible with this unit? How many days of recording time can I store for one channel using a 4K camera for a system having 1 TB of storage? Beyond that, is it simply a matter of simple division for adding more cameras, and multiplication by adding more TB? SKU: IPD401VP. Other than a hard drive, cat5 cable and a monitor, is the anything else required for setup. You can also find more videos and information about how remote viewing works for our systems here. I’m installing this in a vacation home. The cameras will be set to record in the motion mode. Will I be able to remotely access the NVR and set the cameras to view in real time and switch back to motion record? The NVR will always allow you to live view cameras while it is recording. Looking to integrate this with some existing foscam/amcrest cameras at a residence. Verifying this will work with the existing cams that are ONVIF compatible. Also I'm assuming the HDD utilizes SATAIII? Amcrest cameras are ONVIF compatible with our NVRs, however foscam cameras are not but you should be able to fetch video using a url in rtsp mode. Yes SATA3 is supported, max of 6 TB supported. Do any of your NVR support SSD hardrives and Raid mirror configuration inside the NVR without having to go to an external NAS. We have tested our NVRs with Samsung 840 Evo and 840 Pro SSD and they work fine. This unit does not offer RAID. We have some NVRs that offer software RAID. However, with SSD you really don't need the RAID function. Will any sata hdd work with this unit? We recommend using WD purple hard drives. What exterior enclosure do you recommend for NVR? A suitable enclosure depends on the size of the NVR. For our mini NVRs you can use this weather proof enclosure. However this NVR would not be compatible with the above mentioned enclsoure due to its size. Can this be operated vertically, such that the dimensions are 14.8 × 10.9 × 2.3 inches (H*W*D)? It would be removable to allow for cable, USB port, and button access. Yes you can mount this 8 Channel NVR recorder vertically, as long as it is straight and not slanted. You have to worry about the hard drive inside. It has spinning platters. If it is slanted , it can cause undue stress on the drive. If you use a SSD then it would not matter, as the NVRs do not have any moving parts. Also, please note there are no buttons on this unit. The unit is usable with the wired USB optical, or you can use a 2.4ghz wireless mouse. Hello, I currently have a 8 GW security cameras. 6 are GW-2040ip and 2 are GW-5050ip. Are these compatible with your NVR's? The PoE is auto sensing as it 802.3af and 802.3at compliant. It negotiates power with another 802.3af and 802.3at device. Can the PTZ function of the cameras attached to this unit be exercised remotely via the app on a phone or tablet? I'm interested in the 8 channel NVR. What is the minimum amount of storage I will need? It depends on how many days of storage you need. Please provide the number of cameras, the resolution of cameras, and amount of days of storage you would like. Does the NVR408P4K have software that has motion detection/ video analytics, line crossing, face detection, the ability to see what happened before the triggered event? This NVR offers motion detection and Tripwire, Intrusion, Abandoned or missing object detection when used with IP cameras with video analytics that we sell. Our NVRs are compatible with most Lorex IP cameras. To be sure, please email our Tech Support Department here. There is an IP camera compatibility list that is mentioned in the product description for other brands. Considering purchase of the NVR408P4K, but note that description states that "3D PTZ Control: easy control/targeting of Avalonix PTZ cameras, and easy preset/tour setup from NVR". I am not sure whether my chosen camera is an Avalonix compatible and will have all features. I do not mind controlling PTZ with keyboard arrows instead of joy sticki. Selected PTZ camera is 1080P PTZ IP Camera, 25X Zoom, Auto Tracking SKU: IPPTZ25AT. 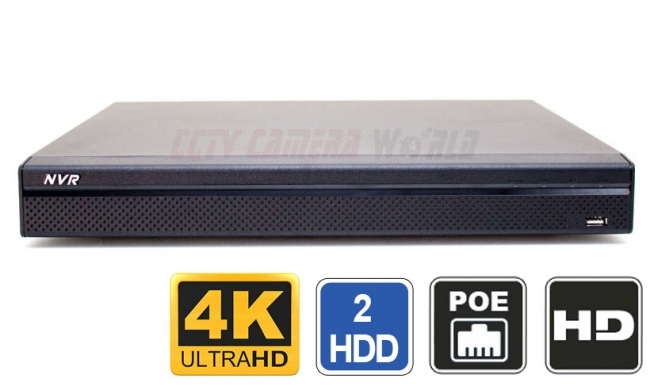 I will also run a 4K IP Camera Bullet SKU: IPC4K11. All of our PTZ and other cameras are Avalonix Brand, so they will work with our NVRs. The IPPTZ25AT Will work with this 4K 8 Channel NVR and allow for 3D targeting. The IPC4k11 camera will also work with this NVR. Hello, SKU:NVR408P4K Is there privacy masking function? Yes there is. It is available with most IP cameras we sell and the NVR allows control of that from the NVR. How many cameras can this show at one time via its HDMI output if all cameras are setup at 4k? My current NVR can only show 2 cameras at a time and Im trying to find a solution that will show all cameras on my TV at once. This 8 channel NVR supports up to two 4K cameras in main stream mode during video playback. During live view mode, the cameras are displayed using their substream, supporting a total of 8 cameras. You can read more about over decode ability of NVRs here. To display 4 channels of 4K video in playback mode, this 16 channel NVR is the smallest NVR available. I'd like to replace 2 existing SD analog cameras at the front of our neighborhood with 2 HD IP bullet cameras. I would then put a cheap 8 port PoE switch to put into the existing enclosure at the front. Then using a Ubiquiti Point to Point 5GHz solution, send that to a home and place the NVR indoors. Is this type of config possible with this? Yes it is mentioned in the blog article we have. Our NVR are compatible with our ip cameras. Can I install my own hard drives in this NVR? Yes you can. Please note the limited warranty does not cover damage as a result of improper HDD installation. We recommend using WD purples only.